Well I decide to add Portuguese lit to the Spanish lit month I had a look at what was out there and this is one of the first books to catch my eye as it is the first book from Guinea Bissau to be translated into English. Abdulai Sila studied electrical engineering and worked for cisco and other companies in the US before he returned to Guinea Bissau, where he set up Sila Technologies to bring affordable tech to his homeland. He has written three novels this is his second book and the first to be translated into English. The young girl needs to learn how to be in the big city for the white folk !! 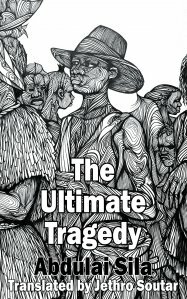 This is maybe a classic African tale it is the story of one woman’s journey and also shows a time when Africans in the former Portuguese colonies were starting to question the place in the world. Ndani is sent from her rural village to work for a Portuguese family in the capital Bissau. The first thing that happens is the woman of the house starts to try and get her to believe in the church as her children have flown the nest and her husband has his eyes elsewhere she is trying to baptise the young girl, but as Dona Deolinda is doing this. The master of the house has other ideas for the young maid she tries to esca[e him but in doing so is shown the door . Where on she meets the village cheif Regulo, but he is uneducated but the young girl is settled he has tried to improve his village much to the opposition of the administrator, by building a school and his huge house to try and show the locals are moving up in the world. Ndani also meets the teacher from the school a man she connects with but what will happen. The teacher after first meeting Ndani is torn between religion and Lust in a way . As I said a classic tale of a young woman leaving her home, now she has been told by the local juju man that she is the carrier of a bad spirit and in a a lot of ways her journey is a long one and through her eyes we see the awakening of the locals in the Village chief and the way he wants his village to improve. As I say this is a universal story It reminds me of one of my favourite stories Stones in a landslide which also followed a young girls journey from a village. There are other stories from Africa like the Zimbabwean novel Nervous conditions which show a young girl growing up in the background of that country breaking from colonial rule. May I also say this is one of the most eye catching covers of the year.